"The Lion" ☼ ☼ ☼ ☼ BANG ! 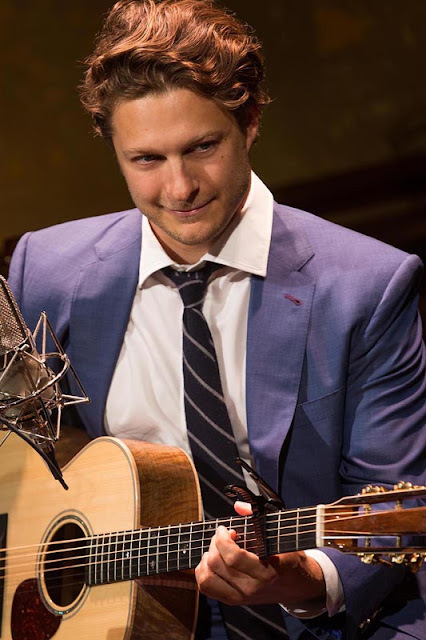 Benjamin Scheuer had me with his first guitar riff. "The Lion" is the finest show we've seen all year, as well as the shortest. All those songs, all that grief and joy, a brilliant guitarist and singer, a story that ebbs and flows and then flows some more. Half a box of kleenex later you walk out of the theater and you look at your watch and realize the whole thing lasted less than forty five minutes. It's impossible. And yet -- I was there. And you should go too. Scheuer wanders around the stage, playing different guitars, but, as good as he is, only three of them sound different (electric, small acoustic and the rest). They probably have different tunings, so that's why he does it, but…maybe a different sound now and then? Maybe we could even see that banjo? OK, we're stretching it. Maybe he could sing in Swahili too. And his name has three vowels in a row. Sometimes the reviewer needs to shut up. There is nothing in this show but pleasure. Go quickly! "The Lion" only runs until May 1. RATINGS: ☼ ☼ ☼ ☼ BANG ! 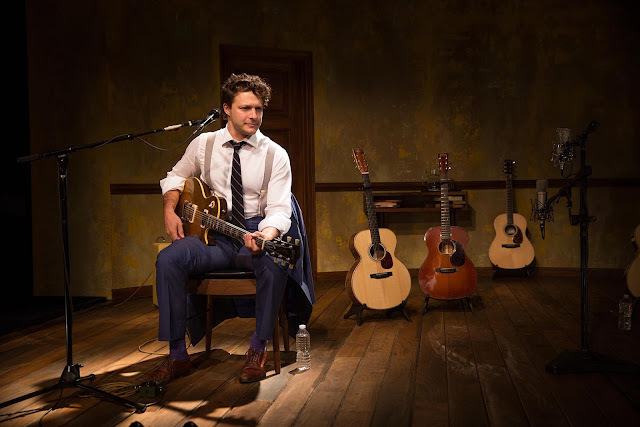 The San Francisco Theater Blog Awards Division awards "The Lion" its highest possible rating for a one man show: Four Stars with a BANGLE OF PRAISE AND AN EXPLANATION POINT! 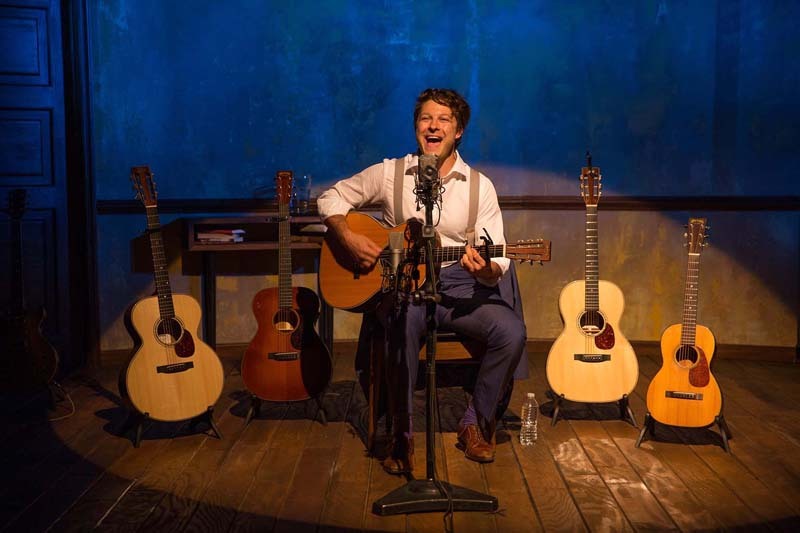 Ben Scheuer can write, play, sing and perform, and earns a Star for each one. The BANGLE is for the one song that touched us most: "You Make Me Laugh." This is one magnificent love song. And Prince died today. You know? Music can indeed be transcendent and change our lives for the better. Keep going, Ben. You're on a roll. You love this show before it starts. Nina Ball's castle interior, with all those doors for characters to hop in and out of, gets us ready for all the machinations and pomp of Tudor England. And it just gets better. 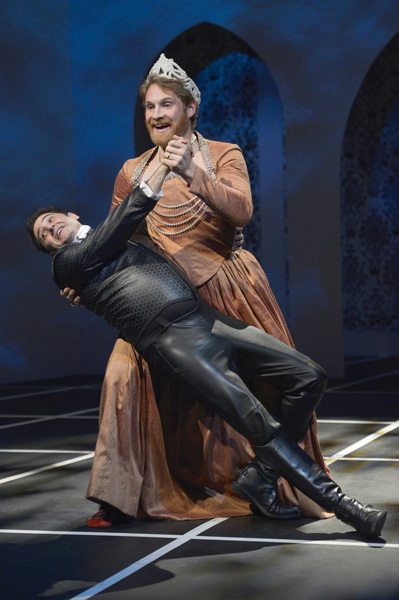 This is only the second American production of Howard Brenton's 2010 homage to the mysterious and short-term second wife of Henry VIII. She has historically been presented as an unfortunate victim of Henry's lustful appetites. Here, she becomes a willing conniver whose true goal, in tandem with Thomas Cromwell, is to bring Protestantism to England. 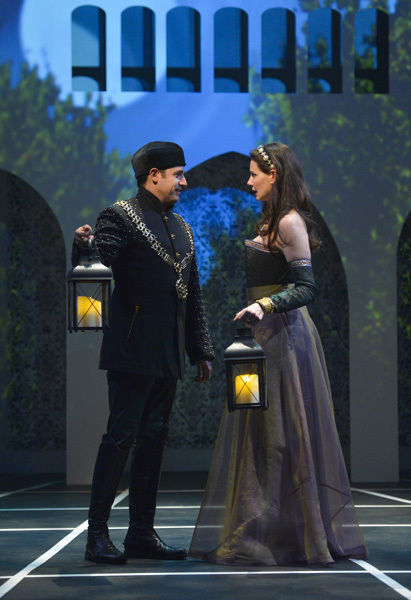 Whatever the truth may have been, Liz Sklar is mesmerizing as Anne Boleyn. In a role that demands we see her as both a woman and a ghost, she keeps us pulling for her, despite the history with which we are well acquainted. Craig Marker is Sklar's equal, as King Henry VIII but even more as King James 1 (Henry's grandson through Mary, Queen of Scots). We also loved Charles Shaw Robinson's two roles as Lord Cecil and Cardinal Wolsey, as well as Dan Hiatt as Tyndale. And Ashley Holvick's costumes are worth the price of admission by themselves. 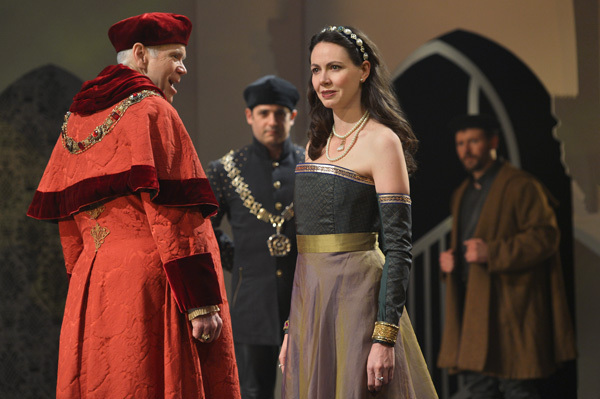 Anne Boleyn has been portrayed many times throughout modern history. Here we get a far more nuanced view. Historically accurate or not, it makes for great entertainment. The San Francisco Theater Blog Awards "Anne Boleyn" Four Stars. Mrs. Kritic, the reviewer's wife, really loved it. The reviewer himself was enthralled with Act 1 but found his eyes getting heavy during an extended Act II. As is always best in situations involving love and theater criticism, he will err on the side of keeping his head. Four Stars. 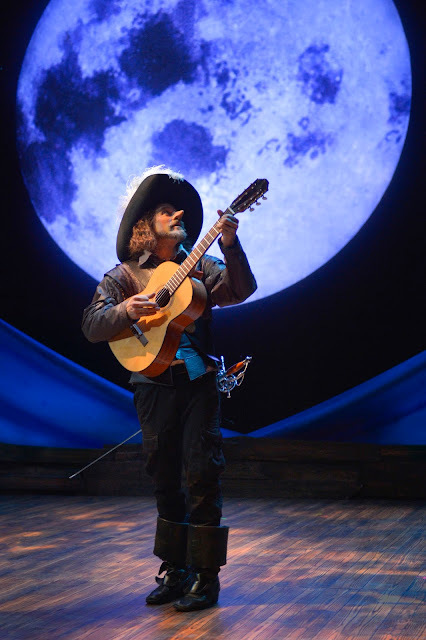 Cyrano de Bergerac lived a short life in the 17th Century, a dramatist known for his swordplay as well as his wordplay. In the 1890s Edmond Rostand's"Cyrano" immortalized Monsieur de Bergerac's oversized nose, and the rest is history. The classic story of impossible love and failed opportunity has been performed countless times and in many languages since then. This is even the second presentation by Theatreworks, this time a newer adaptation by Michael Hollinger and Aaron Posner. There are two memorable scenes in Act One. 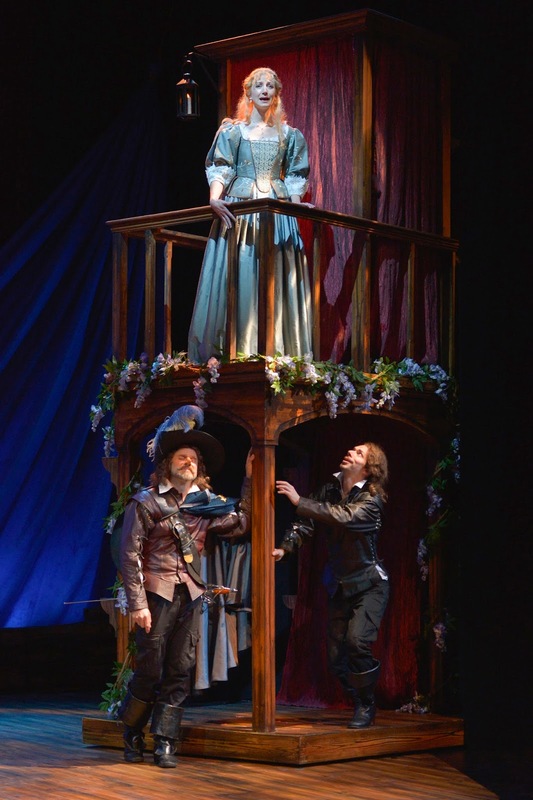 In the first, Cyrano (J. Anthony Crane) becomes the bard, composing and singing an ode in iambic pentameter while simultaneously dueling with a Duke. 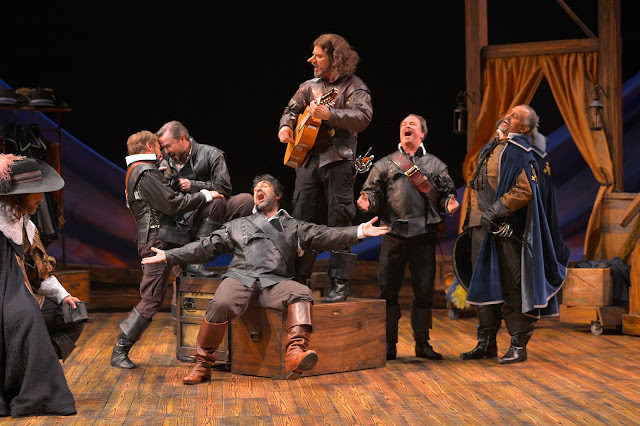 In the second, Cyrano dispatches a hundred foes, one after the other, all dumb enough to stand in a line and attack him one-on-one. It appears life was cheap in the seventeenth century. 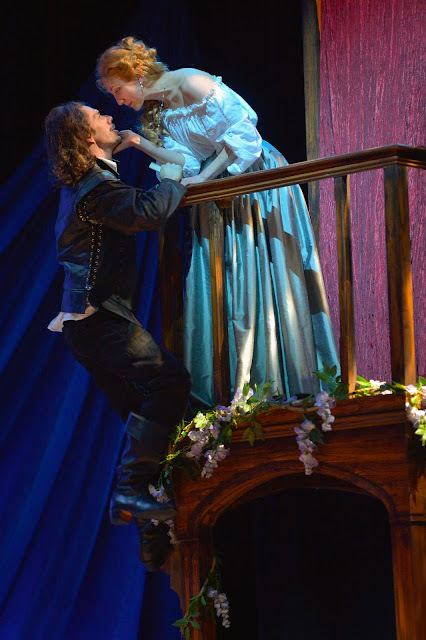 In Act Two we get the memorable balcony scene, where Cyrano declares his love for the fair Roxanne (Sharon Rietkerk), but does it through the mouth of Christian (Chad Deverman), whose nose is the normal size. This is a lovely set piece, with all three actors playing off each other effectively. It is all good fun, but we must mention that Act Two feels like Acts Two and Three. They desperately need to shorten it or remove the lengthy epilogue, or perhaps it is just a further story that feels like an epilogue. 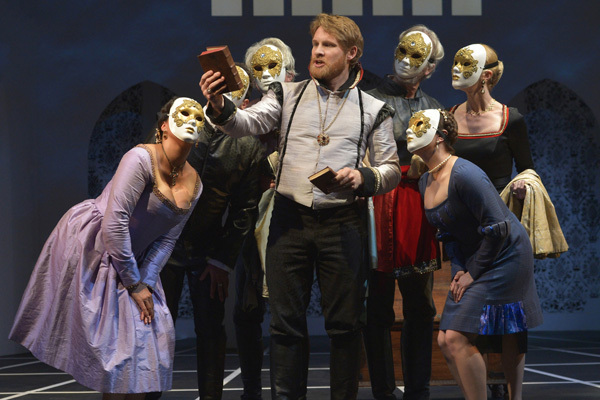 An otherwise witty production grinds to a halt as we duel the author to get to the finish. 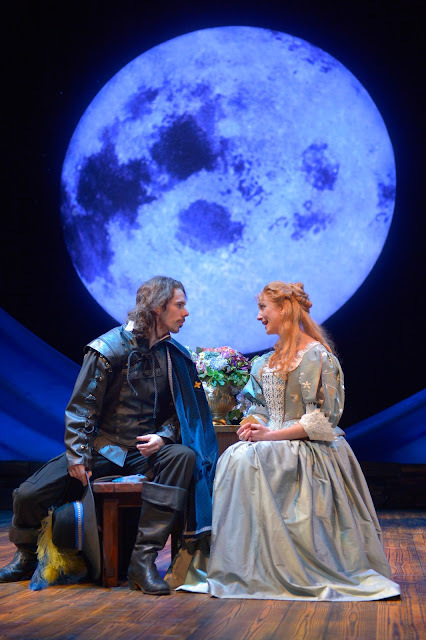 The San Francisco Theater Blog Awards Division awards "Cyrano" Three Stars with a bauble of despair, but the bauble would be removed if they simply tighten up Act Two and pare it down to our admittedly limited Twentieth Century attention spans. We have seen lots of Charlie Varon shows through the years. (2016 is his 25th year doing spoken word at the Marsh.) His current trilogy, dealing with issues of aging and taken from interviews at a convalescent home in San Francisco, has a great deal of promise, but we were not knocked over by last year's first installment, called "Feisty Old Jew." 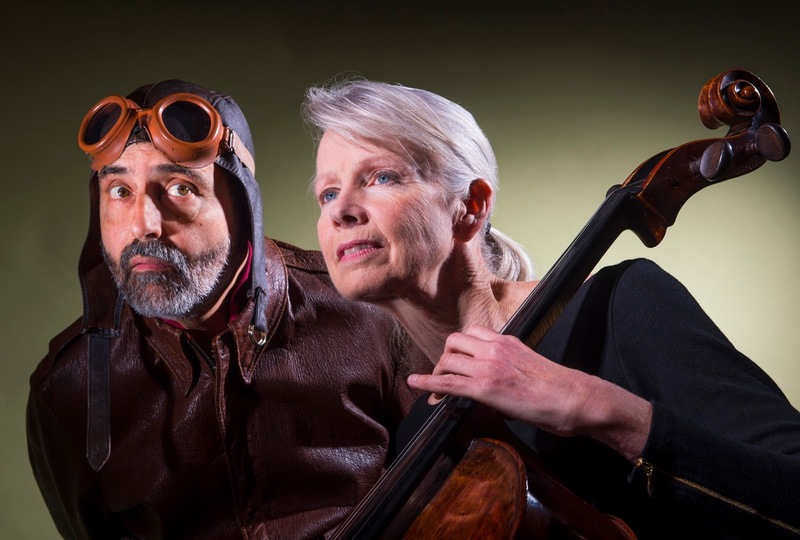 So it is with great pleasure that we can announce that "Second Time Around," a duet for cello and storyteller, performed with cellist Joan Jeanrenaud, is the best Charlie Varon show we have seen in years. 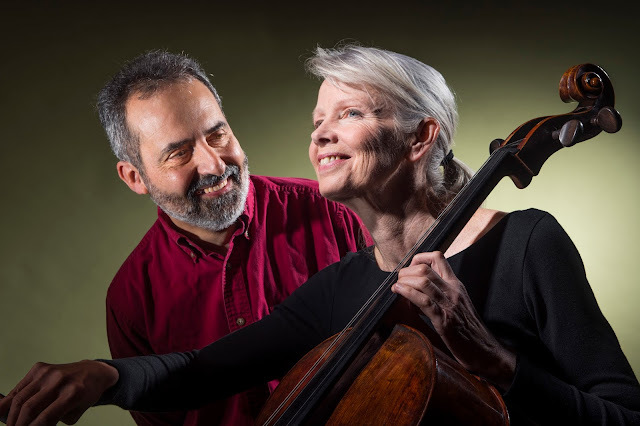 The music takes awhile to get going, but when it does Varon can play off the emotion of the cello and Jeanrenaud can riff along with Varon's tale. This is in many ways a perfect match. As always with Charlie Varon, we have favorite lines. We love his description of his 92-year-old hero Ben Rosenau as "An astronaut with his helmet of white hair." Ben was a bomber pilot in World War II and his memories are the centerpiece of this story. We might prefer that we didn't see the end of the Lou Coombs story coming from so far away, but it is touching nonetheless. Peter and the Wolf this is not. And it is not a cello concerto, it is a story embellished with music. The cello adds texture to Varon's voice and Varon gives emotion to her themes. 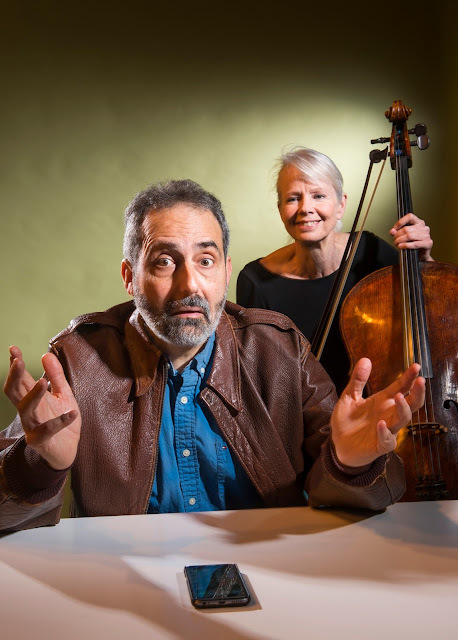 Well done, Charlie Varon and Joan Jeanrenaud. The San Francisco Theater Blog Awards Division awards "Second Time Around" Three Stars with a BANGLE OF PRAISE. Charlie and Joan earn one star each, director David Ford another. The BANGLE is for the concept itself. Spoken word can be tiresome, and so can a solo musician. As Ben says, it's all about human connection. 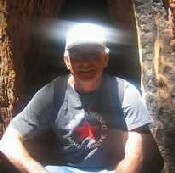 Charlie Varon and Joan Jeanrenaud have it and allow us to share along with them. 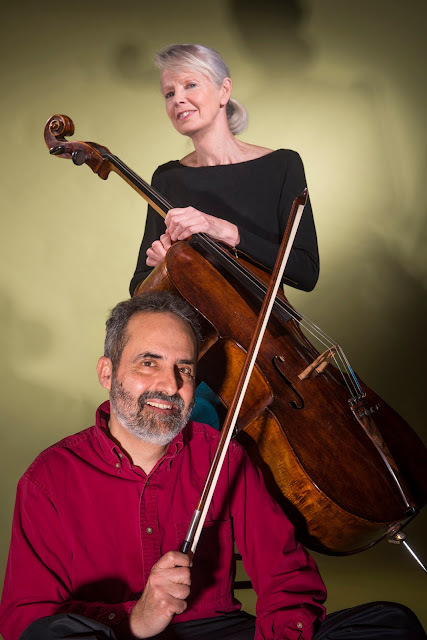 Joan Jeanrenaud and Charlie Varon: "Second Time Around"